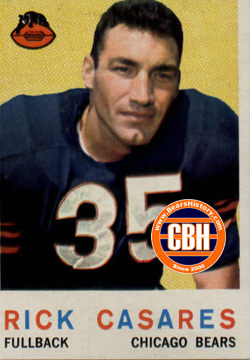 Native Floridian Casares was selected by the Bears in the second round of the 1954 draft from the University of Florida. He led the Bears in rushing from 1955 to 1960, and the NFL in 1956 with 1,126 yards. Teaming with phenom Willie Galimore in the backfield, the duo combined to pace the Bears rushing attack for their 1963 NFL Championship. Casares retired as the Bears' all-time leading rusher in 1964. His totals have only been surpassed by Walter Payton and Neal Anderson in the team's annals. Many former Bears legends, including Mike Ditka and Doug Buffone, call Casares "the toughest man to ever have played for the Bears."